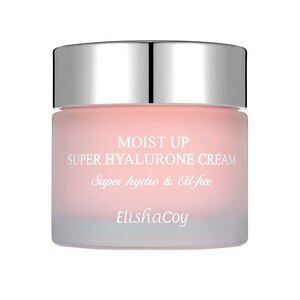 Scientifically proven to hold moisture for up to 80 hours for long-lasting coolness and moisture on the skin (clinically proven for 80 hours moisturization by Korea Institute of Dermatological Science). Ingredients: Water, Butylene Glycol, Cyclopentasiloxane, Cyclohexasiloxane, Niacinamide, Glycerin, Pentylene Glycol, 1,2-Hexanediol, PEG/PPG-17/6 Copolymer, Diethoxyethyl Succinate, Ammonium Acryloyldimethyltaurate/VP Copolymer, Carbomer, Arginine, Phenoxyethanol, Betaine, Trehalose, Sodium Hyaluronate, Centella Asiatica Extract, Magnolia Kobus Bark Extract, Squalane, Adenosine, Disodium EDTA, Cetyl Ethylhexanoate, Neopentyl Glycol Diheptanoate, Hydrogenated Phosphatidylcholine, Alcohol, Argania Spinosa Kernel Oil, Hydrolyzed Hyaluronic Acid, Polyglyceryl-10 Myristate, Cetearyl Alcohol, Stearic Acid, Polyglyceryl-2 Stearate, Carthamus Tinctorius (Safflower) Seed Oil, Oenothera Biennis (Evening Primrose) Oil, Polyquaternium-51, Ceramide 3(Ceramide NP), Ethylhexylglycerin, Pancratium Maritimum Extract, Prunus Persica (Peach) Fruit Extract, Rosa Centifolia Flower Extract, Hydrolyzed Collagen, Caprylyl Glycol, Honey Extract, Sophora Japonica Fruit Extract, Althaea Rosea Flower Extract, Aloe Barbadensis Leaf Extract, Ethyl Hexanediol, Glycine, Serine, Glutamic Acid, Aspartic Acid, Leucine, Alanine, Lysine, Tyrosine, Phenylalanine, Threonine, Proline, Valine, Isoleucine, Histidine, Methionine, Cysteine, Magnolia Biondii Flower Extract, Trifolium Pratense (Clover) Flower Extract, Lilium Candidum Flower Extract, N arcissus Pseudo-Narcissus (Daffodil) Flower Extract, Iris Ensata Extract, Leontopodium Alpinum Extract, Rosa Damascena Flower Extract, Freesia Refracta Extract, Syringa Vulgaris (Lilac) Extract, Nelumbium Speciosum Flower Extract, Fragrance. Take a small amount of the product and spread it softly from the inside of your skin to the outside.